Lowdown: Examining the question of whether or not Obama's presidency failed to deliver on his "yes we can" promises. President Obama is a riddle to me. I went on record marvelling at the promise he brought with him to office: stop torture, close Guantanamo, end the USA's Forever War... Yes we can! Eight years later, it appears to me as if Obama not only failed at those, he also further added to the mix of bad things happening in this world. He waged drone wars out of the public's eye, went on new escapades at Libya (that failed), almost went on one at Syria, and - thanks to Mr Snowden for enlightening us there - not only accepted the Bush administration's surveillance machine, but also did his best to further enhance it behind the public's eye. I am thus inclined to go out and claim Obama's presidency was a failure. But was it, really? The man is obviously very intelligent, and regardless of all the bad things he did to me (including, other than reading all my emails, telling me off for fetishising my phone) he does seem like a well meaning person. So where did I go wrong in my assessment? Was I wrong to fall for his charms back when he came into office, or am I wrongly accusing him now that he is about to leave office? 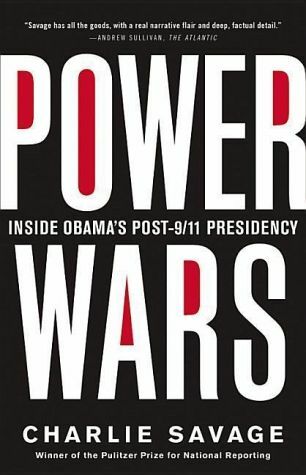 Charlie Savage, a veteran journalist from the New York Times, comes to the rescue with his book Power Wars. In this very long book Savage analyses this very question and presents his case, supported by numerous interviews, snippets of information, and simply being there when events took place. According to Savage, the core problem faced by Obama was how to adapt the USA to a constant state of war. In previous episodes we had wars that begin and end (say, World War 2); in those wars you would know exactly who your enemy was, because that enemy came under one state's flag; and once the end of the war was announced, all fighting would stop and POWs released. None of that seems to be the case anymore. It might have been that Obama was genuinely trying to wind down the USA's wars, but those ambitions reached an abrupt end when, close to Christmas 2009, a terrorist tried to bring a passenger plane down over American soil using liquid bombs in his undies. According to Savage, that was a key moment that exposed Obama's presidency style and also answered a lot of the questions regarding the contradiction that Obama represents: while Bush's presidency, or rather Cheney's if we seek accuracy, was all about making the president stronger (more like an emperor), Obama's was all about legality. Obama never had issues with Bush's curbing of civil liberties; all he cared for was whether that curbing was done legally. Obama's, therefore, was an administration of lawyers, led by a lawyer and acting the part. Once you understand that point you understand the key behind Obama's presidency according to Savage: Lots of legal fiddling in order to achieve what the administration sought to achieve in the first place. Like, say, changing the definition of what a war crime is to include stuff like being the travel agent for known terrorists. Or much fiddling around the question of what is allowed to be done under the guise of the War on Terror over US soil, as if the particular location is the most important aspect rather than the act itself. As part of his detailed coverage, Savage provides the detailed history of bulk surveillance in order to explain how we got to where we are in that area (and, as a side effect, why Edward Snowden deserves the Nobel Prize). Bulk surveillance is an interesting branch as the historical account clarifies the lack of debate on the path that our societies ended up taking: there were no legal debates here, just one thing being piled on top of the other until we ended with a regime that would make the East German Stasi drool with envy. But hey, it's all legal! As much as I love to mock the USA playing legal games with itself in order to justify what it wants to do, at least it has a debate going on now (thanks again, Snowden!). But what about all the other countries? We certainly know the UK is a mess. And what of Australia? We're probably the Western country that can boast the least debate over the Snowden revelations. Through the lack of public debate, our government allows itself to be inspired by Obama in the way it treats whistleblowers (and we let it get away with it). Moving on to look at the matter of targeted killing (something we used to refer to as assassinations), it appears the USA has pondered a lot on the question of applicable laws. Are these the laws of war, where anyone can be killed? Or are they normal civilian law, where someone is only allowed to be harmed when they pose an immediate danger? To solve the dilemma, the USA came up with a third option dealing with areas of anarchy (e.g., Yemen) while it implemented a drone assassination program that was a copy of what Israel did before without the slightest of public debates. Not that its new policy is running along smoothly or anything, but let's not make a few innocent dead people here and there ruin our appetite. As a book that a person reads, Power Wars is very detailed, though not in a laborious way. It is clear Savage made a lot of effort to come up with a narrative to drive the book with. The result is the occasional reappearance of the same topic (e.g., Snowden) in different chapters under slightly different facets. However, it can be argued that this confused, self searching narrative, is also the narrative of the Obama administration. Thus the depth and the level of detail in this book allow outsiders like yours truly to get a genuine feel for what running the USA feels like. I will put it this way, Power Wars feels even more authentic and real than House of Cards. Given I am not a lawyer, nor am I personally involved in the affairs described in the book (other than being an NSA target like the rest of us), I would have preferred the executive summary over this behemoth of a book. But I will acknowledge: Power Wars is a history book of our most recent, still ongoing, history. It serves to demonstrate how the little things pile up to make history: waking up in this decade, we find ourselves in a world that has have legally sanctioned assassinations and bulk surveillance. Without enough of us asking "why". Beyond the book as a read, there is still the question of what do I think of Obama given what I learned here? Did he deliver or did he fail? I cannot speak on your behalf, but as far as I am concerned I do not like being the subject of surveillance, regardless of how many important looking lawyers claim it is legal, period. Nor do I accept the claims that said surveillance is fine and dandy on account of it being supervised, because if that supervisor lacks transparency then it might as well not be there in the first place. Secretive FISA courts, and everything that hangs off them, are a sad joke in this so called democracy. Under Obama, the USA viciously hunted down whistleblowers (as demonstrated by dealing with them as if they are wartime spies, prosecuting them with much vengeance, as well as claiming that Snowden should have raised his concerns in house before going out - something they always knew he did). It played with people's lives for short term political gain. It effectively created a secret legal framework, hidden from public scrutiny, to allow government to do whatever it wants. Clearly, these (and more) are more to than what one can simply justify under a "war on terror" flag. I may be judging Obama under ideals too high for a country to live by, but he's the one to repeatedly claim "yes we can". And with that in mind, I call Obama a failure. Overall: Size and depth are Power Wars main assets and liabilities. Despite those, its ability to frequently thrill is worth crediting. I give it 4 out of 5 crabs, knowing fully well this is one of those books that would affect my perspectives on this world for years to come.